Multi-tooth chippers make these sets well suited for high production grooving in composite materials. This super fine dado set cut smooth , perfect flat bottom dados that are free of splinters or chipping. Recommended for heavy duty machinery only. 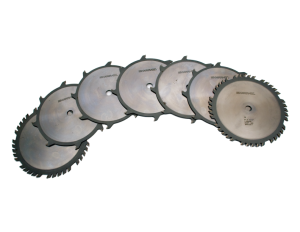 Set consists of 2 outside blades, 4-1/8″ chippers, 1-1/16″ chipper. T10 10" 60T Max Kerf 13/16" 1"
T8N has negative hook outside blades for use on laminates and veneers.